The Gowanus Blue Schools green infrastructure design curriculum is now available! To access this free curriculum, please fill out this quick survey. In 2018, students from M.S. 88, M.S. 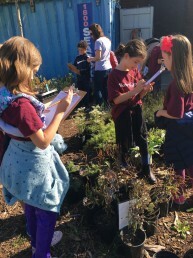 447 and Brooklyn School for Collaborative Studies took on a design challenge with the Gowanus Canal Conservancy to develop green infrastructure design concepts for their school campuses. Students then presented their proposals to a panel of NYC design and sustainability professionals. Following the success of the first year of the Gowanus Blue Schools program, the curriculum developed by GCC, thread collective, and participating teachers is now available for free download. The Gowanus Canal has captivated people for more than 400 years, from its salt marsh era to a polluted industrial waterway that today is undergoing revitalization. 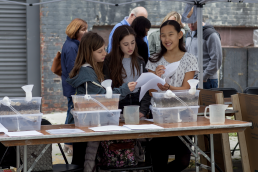 The STEM Gowanus Curriculum is available for for free download for educators who wish to engage students in grades 5-8 with the Gowanus Canal’s complex and fascinating urban ecology. This curriculum was created by the Gowanus Canal Conservancy and the Urban Memory Project. To access this free curriculum, please fill out this quick survey. To access the free curriculum, please fill out a survey.